As this blog gains in popularity (I think I have well over a dozen subscribers now), I get many requests for information about where people should go in a given region. I try to answer each of those requests individually (and will continue to do so), but it finally dawned on me that information from those responses would be great (or at least not horrible) content for this website. 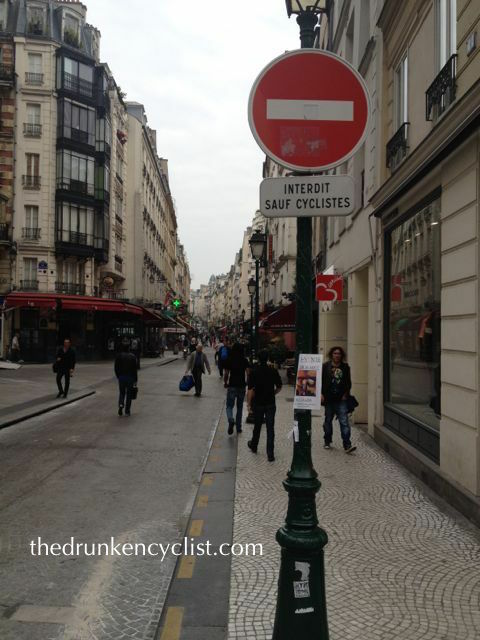 With that in mind and based on some great advice from a good friend (who is known for having brilliant ideas), I have decided to start a new series of posts here on the Drunken Cyclist: “A Few Days In”. The premise is rather straight-forward—I am going to provide my thoughts for a few days in the selected region. I do not profess to be an expert of any of the regions that I will highlight for this new series, nor do I know how regular it will be (so yes, in other words, it is yet another by-the-seat-of-my-pants exercise), so please let me know what you think and certainly let me know if I have left out any glaring “must-do” items. So for this first edition of A Few Days In, I selected my favorite city in the world, Paris. Getting over jet-lag: Everybody who travels frequently has experienced jet-lag and each of those people have their one way on how to deal with it. For me, since I can never sleep on the plane (one of the many curses of being 6’4″), my approach is simple: I stay awake through lunch, take a quick two-hour nap (never more than that–set an alarm! ), and then stay up as late as I can after dinner. The next morning, I wake up in the morning, ready to go. Like any major city, there are countless places to stay in Paris. The problem is that I have never, not once, stayed in a hotel in the city. So even though this will hopefully provide some insight in future “Three Days In:” posts, when it comes to Paris, I am not much help. When we are in Paris, we stay in an apartment owned by the bike touring company for whom I lead trips. Certainly no frills, but a great location and reasonably priced. This is simple. Anywhere. You are in Paris, for goodness sakes. I have always said that you really have to try hard to eat poorly in France, and I stand by that comment. Perhaps more than any other culture, the French pride themselves on their culinary tradition. Some say they have become a bit lazy, relying on that tradition too much, but come on…. Walk. Just go for a walk. Get lost a little and explore some of the neighborhoods. I am particular to the Right Bank (north of the Seine) since it tends to be slightly less touristy (but let’s face it, Paris is the most visited city in the world–there are going to be tourists). Explore a market street. My favorite is the Rue Montorgueil in the 2nd Arrondissement. Within just a few paces of one another, there is a fish monger, several butchers, three fruit and vegetable stores, several florists, two cheese shops, two patisseries, and three bakeries (boulangeries). Oh, and there are two wine shops (more on that later). Walk by the famous monuments at night. The French do many things right, but perhaps I am most impressed with the way they highlight their historical monuments at night. 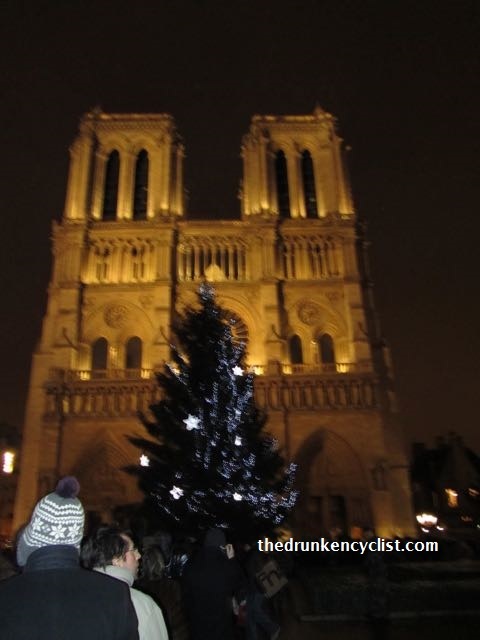 Notre Dame on Christmas Eve. Notre Dame, the Dome of les Invalides (final resting place of Napoléon), Pont Neuf (the oldest bridge in Paris), the Louvre (be sure to go into the courtyard at night and see the I.M. Pei pyramid), and of course the Arc de Triomphe are all stunning lit up in this City of Light. Perhaps the Eiffel Tower is the most stunning of all, and I could write several posts on just on the Tower. Paris is a very safe city, by the way, but you should be careful walking around at night, particularly around the Eiffel Tower. I have never had a problem and have never felt unsafe in Paris, but there are countless stories about pickpockets around the monuments. 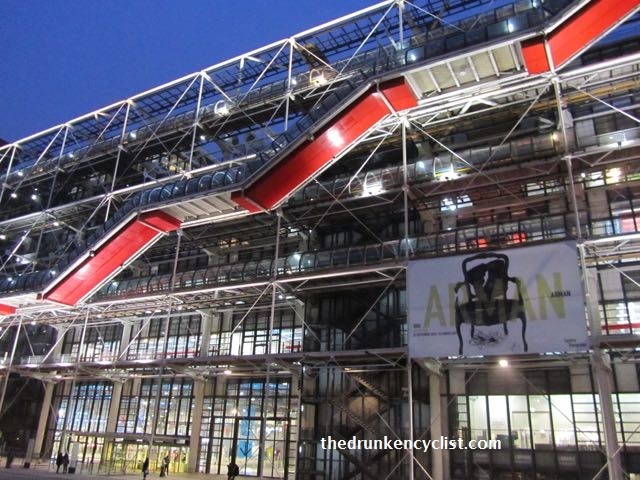 The Pompidou Center is in one of my favorite neighborhoods–Beaubourg. The museum is huge and houses only Modern Art. Museums. For me, a visit to Paris is about walking around, experiencing the city, but if you feel like you have to go inside and look at art, remember, there are a ton of museums in Paris and you will simply not be able to see them all. Perhaps the Louvre is the best example of this–you will never see everything in the Louvre, it is huge. Sure, you might “have” to go, but I would have a plan and spend an hour or two in just one area. Think about it, where most museums around the world have wings dedicated to certain periods, Paris has huge museums focused on those periods. Much like with food, you will have to put forth a monumental effort to drink poorly in France. Good wine is everywhere (the 3-5€ bottles can be good) and great wine is everywhere, too. There are wine shops on just about every block, with the national chain “Nicolas” the most prevalent. Each of the Nicolas stores is independently stocked, so don’t assume that if you go in one it is like all the others. The best place to buy wine, in my opinion, is at a supermarché. They usually have a good selection and almost always the best prices. Sure, it is not as romantic as a tiny wine shop, but you can grab some good deals. I have been to Paris countless times—if I were to hazard a guess, it would have to be close to a hundred, but I never knew that Paris had its own vineyards. I recently read about them one a blog that I just started following called The Riviera Grapevine go over there and check it out. I know on my next trip to Paris, I will certainly be checking out the vineyards…. This entry was posted in Wine and tagged Paris. Bookmark the permalink. It was a great post and I am going to try and remember to reference it the next time I head over to Paris! I have not been to Berlin but check out https://expateyeongermany.wordpress.com . Linda is a fantastic writer and really funny. She just recently moved to Berlin and has a unique perspective…. Thanks! I was going to mention a few other museums (like the Picasso and the Rodin), but I am not the best one to give museum advice. For me, Paris is about the city itself—the smells, the sounds, the light. I could just walk around for days and never go inside. And yes, I want to go back right now, too! The greatest thing about Paris is all the walking you do that burns off the countless beignets and wine consumed! LOL! Great post! Very true! Although I prefer pains au chocolat to beignets! I do the same thing when traveling to Europe. Stay up until noon. 2 hour nap. Back up until as late as I can that evening. Wake up on their time zone fresh the next morning. But man is climbing out of bed after that 2 hours the hardest thing you’ll ever do! You are so right—that first hour after waking up is particularly brutal, but then I have a Kir or a flute of bubbly and I am raring to go! Thanks! 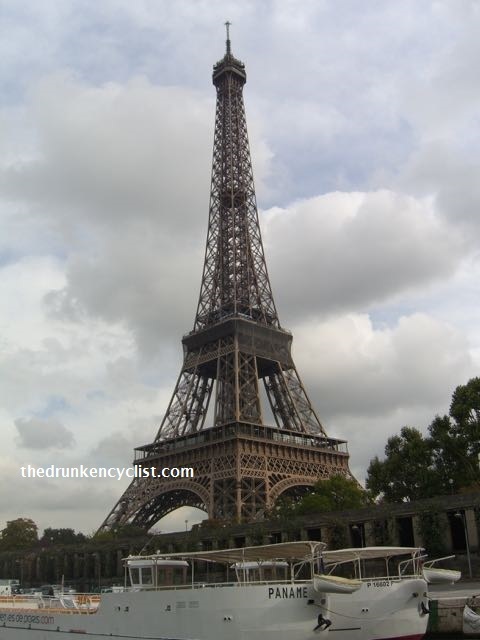 I actually used to hate Paris, believe it or not, but that might be a subject of a different post…. Salut! Ca va? J’ai vu qu’il n’y fait pas trop froid actuellement…. Vous parlez français ? C’est génial ! Mais il faut parler la plus belle langue du monde, non? J’ai étudié à Strasbourg et pendant l’été je reviens pour mener des excursions en vélo partout en France…. Ah, mais non! J’aime bien les Parisiens! C’est bien les Parisiens qui n’aiment pas les autres…. I think the best part of the Orsay is actually the building itself (the art isn’t bad either…). And you are right about the souvenir shops—scary. I have to laugh every time I get on the subway because I am invariably the tallest one there, and it is usually not even close. Thanks for the jet lag advice! I am going to try that next time, because I can’t sleep on planes either. Also agree about the beauty of Paris at night. Try the jet-lag thing and let me know! It works for me…. Alas, I have yet to venture overseas… although I’ve been to Canada and Mexico! 😉 Thank you for the good tips for if/when I ever make it that way. Ah, Paree! Love the place! I’ve been a lot of times but not as many as you – lucky bugger. Mind you my excuse is living in Australia (just a bit further away). We always stay in Montmartre – feels like a very french village when you get away from the tourists and has some great small restaurants. Thanks Nick! I need to make it to your part of the world at some point–always wanted to go…. Love Montmartre! A littlest more exercise to get up there…. I prefer French villages over cities, but I certainly hope that everyone gets to Paris at least once. I still love the Eiffel Tower!!! I agree, the tiny villages have incredible charm–ever been to Sarlat in the Dordogne? I’m going in May! I’m going back to visit Stephane in St. Emilion again, (MyFrenchHeaven.com), this time with a girlfriend, and that’s on our itinerary!!! It is a great little town, you should also try and hit Rocamadour, which is a little further East. Stunning…. I love the new series. Although I have traveled quite a bit compared to some, nowhere near to you! This will be quite helpful and will give me (us – The Traveling Winers) excellent ideas of where to travel next. You might have this already in your mind, but if not, and if appropriate from your vantage point, would love to see a section on “Wineries not to miss” or something along those lines. Awesome idea! I will certainly include it in future posts!